When I was in school one of my least favorite subjects was fractions, and I think that is more or less a universal feeling. However, there are many things in our lives that are controlled by fractions, and one of those is fly fishing. Before you stop reading because you think that I am about to launch into some hyper-technical aspect of our sport let me explain. This year many of the rivers here in Montana remained high and basically unfishable for a much longer period than we have become accustomed to in recent years. When the rivers began to become approachable the clear water was within inches of the bank. If you cannot consistently place your fly within a couple inches of bank your chances of success are nil. Most of my fly-fishing in recent years has been restricted to spring creeks and lakes, and it has been many years since I have spent a day fly-fishing from a moving boat. When a friend of mine recently invited me to float the Yellowstone River I suddenly realized that it had been a couple decades since I had spent a day floating the Yellowstone casting flies from the moving platform of a drift boat. For several years I did some guiding on the Yellowstone, and one of the things that I came to realize was that fly-fishing from a moving boat was a learned art. 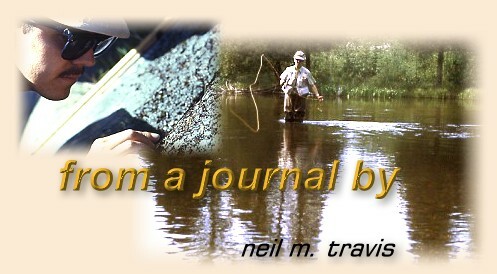 In conventional fly-fishing the only thing that is constantly moving is the water. You wade into position, select your target, and begin to cast. Casting from a moving boat changes everything. You are moving, the water is moving, and the targets are flying passed at breakneck speed. No matter how hard the person working the oars tries to slow the boat down it continues to move more or less rapidly downstream and you must continually pick up your fly and cast it toward the next target that is rapidly approaching. You have to hit that pocket, drop your fly next to that log, get a good drift under those bushes, and you must do all this while you are moving. You have to cast with enough slack to allow your fly to drift without drag, but not with so much slack that you cannot set the hook if a fish should suddenly hit your fly. You must constantly be watching your fly and also preparing to pick it up and make the next cast. I have seen otherwise competent fly casters turn into rank beginners after standing in the front of a moving drift boat trying to consistently put their fly within a few inches of the bank. There are a number of other places in fly-fishing where the difference between success and failure can be measured in fractions. The timing of a successful cast, the distance that the rod travels, the amount of power applied to the cast, and when that power is applied are but a few of the examples of the importance of fractions in successful fly-fishing.